Second Lieutenant Joseph William Gould (York and Lancashire Regiment) is killed at age 31. His brother was killed in September 1915. The following Privates of the York and Lancashire Regiment are killed on this day having also lost their brothers earlier in the Great War. Thomas Daltry is killed at age 23. His seventeen-year old brother was killed last August. R J Cranfield is killed at age 19. His brother was killed in October 1916. Frederick Bennett is also killed at age 19. His brother was killed in July 1917. 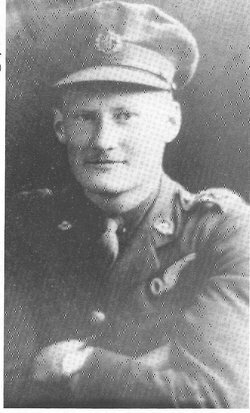 Lieutenant Claude Handley Trotter (Alberta Dragoons attached Royal Air Force) is accidentally killed while flying at night in Essex at age 23. He is the son of the Reverend Canon John Crawford Trotter. He was previously recommended for the Albert Medal for attempting to save his pilot’s life in an earlier crash. Flight Sergeant Albert Edgar Warne AM (Royal Air Force) dies on service at home. He was awarded the Albert Medal for attempting to save life of a pilot who crashed in January of this year. Brigadier General Colin Lawrence MacNab CMG dies of illness contracted on service at home at age 47. Second Lieutenant Harold Robert Robinson (Royal Garrison Artillery) is killed at age 20. He is the son of the Reverend Alexander Robinson. Second Lieutenant Reginald Gillon Christophers (Otago Regiment) is killed at age 36. He is the last of four brothers who will be killed in the Great War. Sergeant Hugh G Matheson DCM MM (Seaforth Highlanders) is killed. His brother was killed in May 1917. Private Robert Miller (Seaforth Highlanders) is killed. His brother died as a result of an accident at home in May 1916. Private Edward John Poole (London Regiment) is killed in action at age 18. His older brother was killed at the third battle of Ypres in 1917. Gunner Henry Davies (Royal Field Artillery) is killed at age 21. He is the last of three brothers who are killed in the war. Private William Alexander Fotheringham (Black Watch) is killed. His brother was killed in September 1916. Private Edward Parker Wilkinson (Royal Army Medical Corps) is killed in Mesopotamia at age 47. He is the son of the Reverend Robert Parker Wilkinson Rector of Longparish. Private John Joseph Hobart (Lancashire Fusiliers) is killed in action. His son and namesake who is born after his death will be killed in November 1944. Member Edith Mary Tonkin (Volunteer Aid Detachment) dies on service at age 26. Her brother was killed in September 1915. Yesterday’s e-mail did not arrive, please send it again.